All jokes aside, escape room theme cliches do exist and that’s not necessarily a bad thing. Definition No.1 is what we’re discussing here, a phrase or opinion that is overused and betrays a lack of original thought. An escape room theme is an idea that establishes a storyline for the experience. A storyline to base puzzles, tasks and activities around so that players can be entertained. An escape room theme is key and can make or break the entire game. I have played good games that have these common themes, and I have played bad games that have these themes. I do not believe that using these themes is lazy or unoriginal, but it is easy. 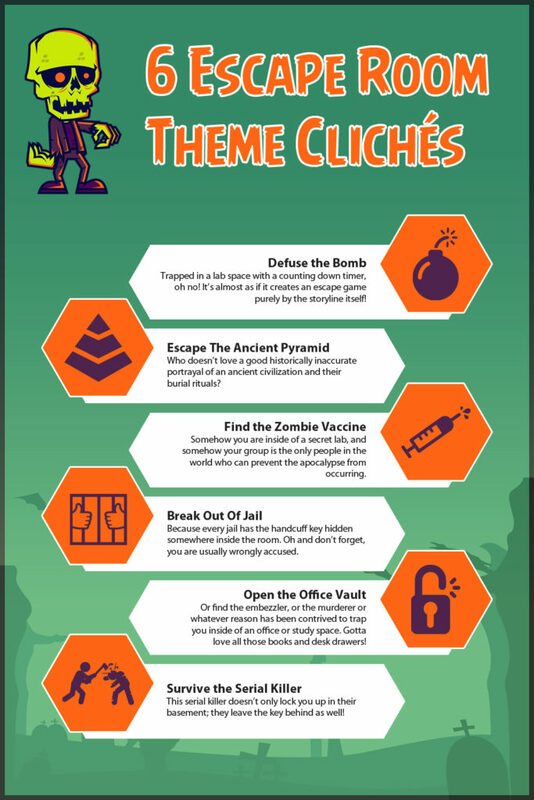 Escape Room Theme Cliches Are Easy? These are essential components of an effective escape room game design, and keep players interested! So of course, these escape room themes will be used over and over again. They provide an unrealistic situation for players, or at least a situation they are not likely to find themselves in, and provides them the chance to prove their worth. These themes are easy because they dictate that time is important, it is inherent in their stories that the clock is ticking and players need to be aware of the time. There is no need to manufacture a reason for the clock to be key to the game. Every group of players wants to feel like they have won at the end. And that doesn’t always mean that they have escaped. An achievable goal, or a situation that has a tangible ending, that can be just as awesome of an ending as finding that last key to open the door. Because let’s be real. Making that bomb stop ticking, right as the last few seconds are counting down? That’s pretty freaking amazing. And one hell of an exciting escape room experience.